What is Bute Paste used for? Bute paste is an analgesic and anti-inflammatory medication used for pain control and to treat lameness in horses due to several musculoskeletal problems, including soft tissue injury like sprains, laminitis and tendonitis, muscle soreness, bone and joint problems like arthralgia (joint pain) and arthritis. Bute paste helps control inflammation caused by joint and soft tissue injury thereby relieving pain and restoring range of motion. Bute paste also has antipyretic properties and can be used to reduce fever in horses that are unable to eat or drink due to fever or if fever hinders recovery form illness. Bute paste can be used for foals provided the foal is not premature or sick. How does Bute Paste work? Bute paste contains phenylbutazone, a non-steroidal anti-inflammatory drug (NSAID) belonging to the benzones class that has anti-inflammatory, analgesic (pain relief) and antipyretic (reduces fever) properties. Phenylbutazone in Bute paste inhibits the cyclooxygenase (COX) enzyme responsible for the production of chemicals called prostaglandins, which are mediators of a variety of cellular processes as well as inflammation. Bute paste prevents the formation of inflammatory prostaglandins which relieves the pain, swelling and stiffness due to inflammation at the site of joint or soft tissue injury in horses. What does Bute Paste contain? Bute paste contains the active ingredient phenylbutazone (200mg per mL paste), a non-steroidal anti-inflammatory drug (NSAID) used to treat musculoskeletal problems in horses. Bute paste contains phenylbutazone, a non-steroidal anti-inflammatory drug (NSAID) that has anti-inflammatory, analgesic (pain relief) and antipyretic (reduces fever) properties and is used for pain control and to treat inflammation in horses due to several musculoskeletal problems, including soft tissue injury like sprains, laminitis and tendonitis, muscle soreness, bone and joint problems like arthralgia (joint pain) and arthritis. Phenylbutazone in Bute paste inhibits the cyclooxygenase (COX) enzyme responsible for the production of chemicals called prostaglandins, which are mediators of inflammation. By preventing the formation of inflammatory prostaglandins Bute paste relieves the pain, swelling and stiffness due to inflammation at the site of joint or soft tissue injury in horses and helps treat lameness. What are the side effects of Bute Paste? The most commonly reported side effects when using Bute Paste for horses include: ulceration of the mouth and gastrointestinal tract and colic. Less common side effects include: kidney damage, oral lesions, and internal haemorrhage; also loss of protein into the intestines due to gastrointestinal damage and this can cause abdominal oedema (swelling). When should Bute Paste not be used? How should Bute be be given to your horse? Bute paste should be administered only under the advice of a veterinarian and given to your horse orally 30 minutes before feeding, twice a day at spaced intervals of 8-12 hours for up to four days, reducing the dose, as recommended by your veterinarian. The recommended dose is 1-2 grams per 450kg per day. Therefore, the recommended dose for horses up to 450kg is10ml twice daily on the first day as a loading dose, then 5ml daily for 4 days, then 5ml daily or every alternate day as required; the recommended dose for ponies up to 225kg is 5ml daily for 4 days, then 2.5ml daily or every alternate day as required. 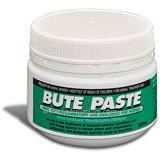 Bute paste should be administered to your horse for as long as recommended by your veterinarian. How long should your horse be given Bute Paste? Bute paste should be administered to your horse for as long as recommended by your veterinarian. If you miss a dose of Bute Paste administer it as soon as you remember, unless it is time for the next dose, then skip the missed dose. Do not give a double dose. How should Bute Paste be stored? You should store your Bute Paste below 30°C in a cool dry place and protect from light.